stars - Based on 17 reviews. The garage stop prevents damage to personal belongings and interior walls by helping drivers stay within a designated parking spot. This black and safety yellow wheel stop is particularly useful for homeowners who store equipment or valuables inside their garage as well as novice and teen drivers. Made from 100% recycled rubber post-consumer tires. Reflective yellow stripes provide maximum visibility. Installs without mounting hardware. Garage parking aids are essential because they help drivers stay inside the designated parking spot and not beyond it. This reduces the risks of damaging interior walls and personal belongings. Our store offers black and yellow safety wheel stops that are very useful for those who have a small garage and shop equipment and valuables inside it. It's also ideal for novice and teenage drivers who still find it difficult to maneuver their vehicles in tight spaces. The parking stops available in our shop are made from high-quality materials, giving you the assurance that they're both reliable and sturdy. They are robust enough to withstand the impact of most vehicles. The rubber variation is one of our best sellers because not only is it affordable, it can also be used in different areas, but usually in residential garages. 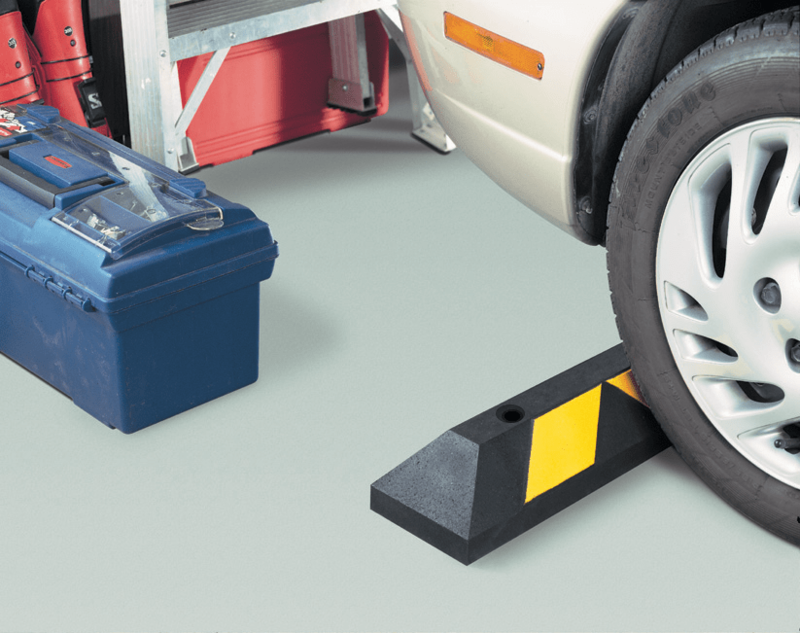 These parking aids are sturdy enough to stand on its own and maintain its position even in a home garage or other parking locations. That means you don't have to worry about any installation, so you won't hurt your personal garage floors. All you have to do is take the measurements of where you are going to place your parking stop, and that's it. 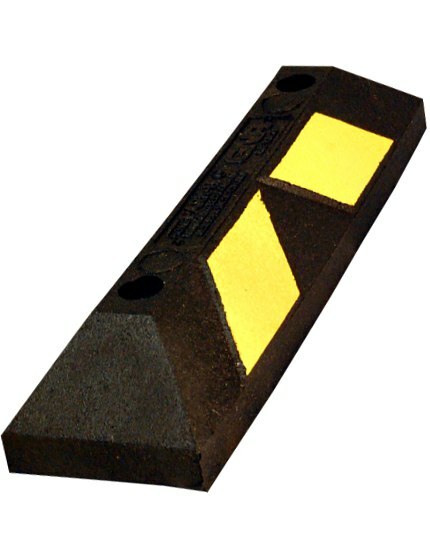 We offer a broad range of professional garage parking aid car stop made from high-quality rubber with black and yellow reflective stripe making it highly visible even during the night. Parking garage aids won't only make your garage more organized, but it will also save you from all the stress, trouble, and money due to damage to your garage. No more worrying about hitting your walls to damage your car or home! Each year, car model gets bigger and bigger. That means a typical residential garage may not be able to house a modern vehicle like how it used to. Even if it does, it would be a challenge to park it inside the garage-- scrapes and damages would likely occur. Fortunately, with the use of a garage parking aid-car stop, you don't have to worry about this at all. Fitting your car inside the garage has never been easier because of parking aids. These can range from handy parking mats to something more advanced, such as modern sensors. The best ones are known to be durable, sturdy, clearly visible, and easy to install in a garage. There are plenty of reasons for you to use a garage parking aid car stop. For one, it could be painstaking to correctly position your vehicle in a cramped area. Without a parking aid, you're going to spend a lot of time trying to figure out the 'ideal' position that wouldn't damage the interior walls nor the equipment in the garage. Likewise, you'll probably end up repositioning your car over and over again. This can be frustrating since you can't even go out to check if you're close to getting to that position. All you're capable of doing is to judge how far to back up the car and carry out a parking maneuver from there. With parking aids, even those with large cars won't find it difficult to park their vehicles in a small garage. Although you can also consider the DIY route and have the “tennis ball on a string method,” it would still be better and more presentable if you'll get the garage parking aid instead. For a new driver, the responsibility of parking within the confines of the garage is no joke. Despite the fact that it's important for a driver to gain enough spatial awareness when parking, the use of parking aids would help you avoid accidents. Overall, parking is already difficult as is; what more if you have to do that in a small area? Fortunately, these devices would help you position your car smoothly and maximize every space inside your garage--- you can use it for storage, and still be able to park with ease. With so many industrial and commercial applications for Garage Parking Aid Car Stops, it can be difficult to understand the type of Garage Parking Aid Car Stops you need for your project. The Traffic Safety Store has years of experience helping customers just like you choose the perfect Garage Parking Aid Car Stops for any project or application. For a while I’ve been needing some kind of marker to indicate my vehicle has cleared the garage door. The “car stop” solves it...a simple, but important solution! My car lines up perfectly, very easy to see and tires never go over it. Very well designed. It works well but need a way to keep the barrier from moving. It moves a little every time I touch it w/the car wheels. I don't want to drill into the concrete floor to install permanent anchors. Considering tape. Anyone w/ another idea would be helpful. No more holes in wall backing car in ! Was exactly what I was looking for they really work great. Love the experience. No complaints. Package came on time. It was perfect..can park my truck without getting out to see if my front in clears garage door.. They are perfect and look great. I’m very glad I got these parking stops. It helps to park my SUV in the garage. Fits just right. Not to big, that I trip over it. But just the right size to stop the car! Exactly what was advertised and sent in a timely manner. I like it. Great product. Heavy to stay in place, and easy to “hit”” due to size for proper parking. This was exactly what I wanted and it. I could not be happier. The two I bought work just the way I hoped they would. I recommend them. Very Good. I received what I ordered in the time frame that was promised. No suprises. Received promptly and in good condition. There was a problem with my delivery address, and they contacted me right away to clarify it. Bumber stops for my two cars. They were delivered on time. No complaints. Prompt service, emails advising when shipped. Easy to order on line, prompt shipping. Using product now, works great. incredibly fast shipment. must have shipped as soon as they received the order! Great experience. Really fast delivery; excellent quality product; exactly what I wanted. Just what I wanted. Prompt delivery. Good follow up. Traffic Safety had a gre selection at good prices. Product came in a timely manner, and is exactly what we need to take the frustration out of getting our car in the right spot in our narrow garage. Received my order within 3 days of placing the order. Great shipping service and quick turnaround! Wonderful customer service! Answered all my questions and delivery was extremely fast!!! Highly satisfied. Fast shipping - happy customer. Arrived quickly and was as described. Great job! Excellent place to shop online. Purchased two sets of vehicle blocks for our garage floor. Shipped quickly and items are as advertised. Stops our two vehicles in exact location. Very happy with product and transaction. Traffic safety store responded immediately, shipped our items the next day and kept us informed each step of the way. Speedy. Ordered my item on Saturday and received it on Wednesday as promised....know that's service!! 1st Time Order - Amazing Service! I ordered a garage parking stop online, on a Sunday afternoon, and it was delivered on Tuesday afternoon! I couldn't believe their amazingly-fast order processing and lightning-speed delivery! I will definitely do business with the Traffic Safety Store in the future! Great Product. This is the second Garage Block Parking Curb that I ordered. They are fantastic! I no longer worry about hitting the garage wall when I park in the garage. They function wonderfully and are not too heavy. Great buy. Just as Advertised! "A lot of great things to say about the service. First, the shipment was extremely fast. I received it the next business day. Second, the product is extremely durable. I tested the efficiency of the parking block with my truck several times, and it worked. Last, I appreciate how lightweight it was and how easy it was to install. I already have neighbors looking to purchase." "I am very pleased with your product, it was just what I was looking for and doesthe trick for me! So glad I could find this on-line! " "Great product. Quick delivery. Waiting for my new garage floor to be installed, but tried them out and they worked great!" Quick delivery in time for Christmas. Exactly what I wanted. Delivered quickly. Product is great. My 22" Garage Block Parking Curb arrived the day after I ordered it. It works great and I am pleased with the service we received. Exactly as advertised; quick shipping; great communication. Yeah Man! Good product. Good price. Fast delivery. What more can you ask for? Fast efficient service. Great price. "The whole ordering process was smooth and fast. Products were shipped put the same day." "ALL EXPECTATIONS MET, GOT EXACTLY WHAT I ASKED FOR "
"Car stoppers are in and working very well. I would purchase again from the traffic safety store." "Received parking blocks timely. Seem to work well in my garage." "Exactly what I ordered. On time. No fuss." "Traffic store filled the order fast and delivered the product as estimated. The garage bumpers look good and the installation was easy most importantly after researching the web Traffic Store had the lowest price. Best bang for the buck!" "The wheel stops were of very good quality and do exactly what they are supposed to do - keep our cars from going too deep into the garage. Very pleased. Diana"
"I found the recycling of old tires a good move. So far they look great and have performed as advertised." "Easy order process, fast delivery, extremely pleased with the entire purchase. Thanks." "Great experience. Was concerned the wheel stop would slip but it is heavy enough to keep our pickup truck where it belongs. The service was incredible. Delivered when they said. With all the problems with deliveries being stolen off of porches, it would have been nice if UPS had rung the bell when they delivered so I knew it was there. The only way I knew someone was there was when my dogs barked at the door. " Fast and efficient. My order was processed and delivered to me on time. I had two of the stops in my garage already and needed two more. My two previous stops have held up great over the years. Just set them on garage floor and work like a charm. Great. I got just what i ordered today. 12/5/2014. It really is fastest Shipping. I ordered it on Tuesday and got it on Friday. And i really Love my Garage Stop Parking Block!!!! It really works and holds my 2013 Mazda 3 in place. Now i can park with Confidence. And prevent the car from Damaging anything in the Garage. And putting holes in the wall. It's pretty Awesome. It was great!! I have a big car and a small garage. I back in. I needed a "stop block" to keep me from hitting the stuff at the back of the garage. Very simple, very effective. No hardware required. Shipped quickly, arrived quickly... So simple... nice! It has been a real pleasure doing business with your company. I really appreciate everything you have done. I would and will recommend your web site and business to anyone interested in your products. Best customer service by any company I have purchased from on the internet. On all survey questions I give ***** stars. Thanks so much. Great product. Super service & delivery. The garage parking block works GREAT and is exactly what we were looking for. Product works well. Just what we needed in our newly rehabbed garage. Hi: I am very happy, the traffic block worked out perfect. Thank you, Jim. Item delivered on time. No need to secure the parking block to the garage using bolts or double sided tape: it is heavy enough to stop the 4Runner. I ordered my garage stop late in the day and was expecting the items to ship the next day or 2. I ordered these on a Thursday and so I was not expecting to see anything that day. To my surprise the items were shipped within 2 hours. I have bought online before and have never experienced such a quick response. The Traffic Safety Store truly knows customer service. I highly recommend them. Excellent, easy to order and delivered on time, garage bumper just what I was looking for and functional. Exactly as advertised. Fast shipping and a great price too. Also you are recycling. Instead of a tennis ball on a string I put a curb in the garage. Works out great. Arrived promptly, lining up both cars well in our not-very-roomy 2-car garage. Perfect use in my garage. No more need to look for a mark on the garage floor, Just drive in until your wheel makes contact with the rubber curb. Very happy with garage bumpers. Thanks so much for your fast delivery. I ordered the garage block on 11/14/2010 and got it yesterday (11/16/2010). Now I can pull the car in garage and not worry!